You are completely new to the game? How can I make an orange hero? How can I get Soul Stones? How can I get Universal Pieces? - Summon top cards in the shop for 180 runes each day. How can I lvl up the initiative skill from an orange hero? you need Skill Fruits . To be on the safe side use 6x for one skill upgrade. It works also with only 2x but it's random an you need luck. How can I lvl up the initiative skill from a purple Card? never use Skill Fruits. They are so rare and you need it for the golden. How can I get Skill Fruits? How can I earn DKP? For every 5 AP spent on a dungeon you earn 1 DKP. For what do I need Nalu Blessing? Can be received at Lv60, 70, 80, 90, 100. Four Nalu Blessings are issued each time. you need it to learn the talent skill from an orange hero. Every talent has 4 talent skills. 3 to learn and 1 can be activated by the orange weapon. you need it to polish your equipment. one tip: enchant 1st golden rings, 2nd Dark Elf weapons or armor <--- can't get it in the later versions ... after that only the lvl 90 equip. Keeps gold and time. How do I use Summon Contract? It is for Events / Summon Door to push the Resummon button. Try to get a purple or golden boss. If it's max you get also Soul Stones. Where can I get Equip? How can I earn more JB (Justice Badges)? - all world bosses even if you have a low rank and also if the boss will not die! the guild dungeon Zuan Ruins lower and middle and heart of fire lower. 2x purple and 2x blue for only 1 DKP and only for you! If you are strong you can burn down ZRM alone. If you can't, ask an friend to help you. HOF lower needs 2 people one has to be really strong. You can share the equip. But your guild members have to agree it and it maybe needs a rotation so no one gets angry. If you have the power to do it cuz you are officer never do it without to speak with your guild members. To protect you for trouble. A reopen cost only 10 runes. Ask the President to make you VP. Where can I find a guide for the guild dungeon Soul Grave and Hurricane Castle? 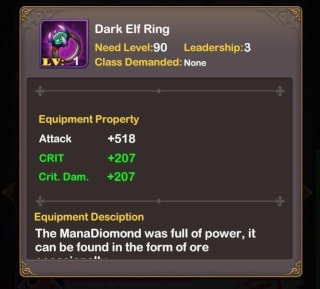 Do you need a golden ring but have no JB or leadership for it? Raid in AHU and get the FlameRingPcs! Create it and sell it. = 10x JB and one pcs for Dark Elf Ring! It needs only 3 LP ... Ok it takes bit and cost gold but in my opinion it worth it.